After a night I probably slept for only 4 hours, hoping that I can sleep during the flight itself, I finally started packing and checking everything was with me. Although I was about to throw myself alone to the other side of the globe, I was relaxed and even relieved the waiting was finally over and the traveling would start. My parents came to pick me up and drove me to the Helsinki-Vantaa airport. I checked in, picked my pre-ordered exchange money from the bank in yen, escaped to the passenger's lobby and soon got on board the airplane. The flight from Helsinki to Frankfurt went finely on the Lufthansa airplane, but the 5 hour wait for the next flight at Frankfurt airport was pretty boring and the air was pretty bad too. I was too tired to read any book properly, but not sleepy enough to get any sleep either. Finally ANA's 747 Boeing airplane set for Japan started to board passengers in. The plane had a Pokemon theme, meaning that the plane was painted with Pokemon characters from the outside, but otherwise the airplane turned out to be an older model of their fleet, which meant that there was no personal monitor for each passenger like ANA's web site promised (of course there was the asterisk that mentioned that not all flights have this luxury). Luckily my seat was to the right of the middle seats and I didn't have another passenger sitting to my left, so I had plenty of space around me. Getting into details (hey, I've never been on a long distance flight before!) each passenger was supplied with a pillow and blanket for comfy sleeping plus an earphone set for listening to a variety of different music channels or watching movies on the big screen in front of us. The difference in flight service between Lufthansa and All Nippon Airways was instantly noticeable. The flight attendants where extremely polite and smiling, always checking on a regular basis if someone needed help. Here I bumped into the first surprise of Japanese habits. Everyone was handed a hot wet towel, which is used to clean your hands before eating. Some wiped their faces with it too. To tell the truth, I felt like a barbarian among the other passengers, the politeness of the Japanese could be sensed during the flight. After a Japanese dinner and tea, the lights were turned off and I tried to get some sleep for this 12 hour flight, but I couldn't. Just of plain irony, they showed the movie "Insomnia" which seemed like a good movie, but I really was trying to get some sleep. Well, at least I was getting closer and closer to Japan... (while flying over Finland by the way). First turn the clock one hour backwards, then eight hours forward. Now when do I sleep exactly? It's a genuine Pokemon-airplane! There's Pikatchu, then there is ... umm, who are these guys anyway? This was given to all foreigners on the plane. It is used during passport checks at Narita airport when arriving and leaving Japan. Helsinki-Vantaa airport - The airport from where I left Finland. Chosen three times as the world's best airport! Frankfurt airport - The airport in Germany, where I switched airplanes. Lufthansa - The airline company I used to get to Frankfurt. 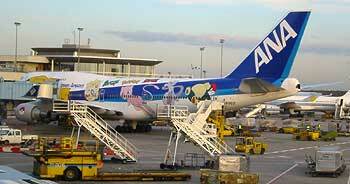 ANA - The Japanese airline company that flew me to Japan.